Cover cookie sheet with waxed paper, aluminum foil or cooking parchment paper. Place candy coating in 8-cup microwavable measure or 2-quart microwavable casserole. Microwave uncovered on High 2 to 3 minutes, stirring every 30 seconds, until almost melted. Stir until smooth. Place peppermint candies in heavy plastic bag; crush with rolling pin or bottom of small heavy saucepan. Pour crushed candies into wire strainer. Shake strainer over melted coating until all of the tiniest candy pieces fall into the coating; reserve the larger candy pieces. Stir coating to mix evenly. Spread coating evenly on cookie sheet. Sprinkle evenly with remaining candy pieces. Let stand about 1 hour or until cool and hardened. Break into pieces. Chocolate-Peppermint Bark: Substitute chocolate-flavored candy coating for the vanilla candy coating. 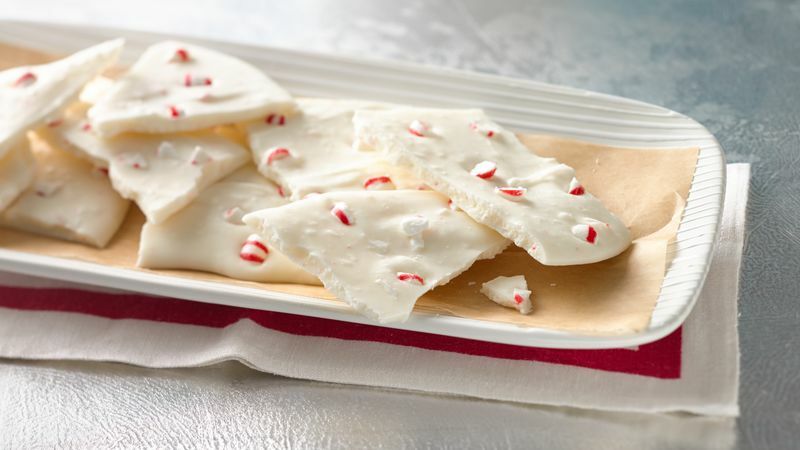 Drizzled Peppermint Bark: Heat 1/2 cup semisweet chocolate chips or white baking chips and 1 teaspoon shortening until melted. Drizzle over Peppermint Bark before letting stand 1 hour. Several brands of candy coating are available, and each melts a bit differently. The white color varies, and when melted, some are thinner than others. Make a note of the brand you prefer, and watch carefully while it melts so you can prevent burning. Chocolate-flavored candy coating used in place of vanilla is the way to go for die-hard chocoholics!